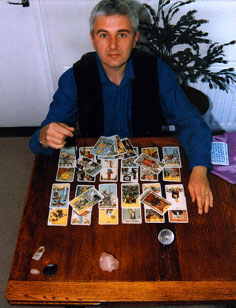 I started reading tarot professionally in 1996 after 7 years of self-study and psychic development work. I had a weekly live Tarot phone-in show on a local radio station (Spirit FM) for 5 years and left the IT industry in 2005 to become a full-time Tarot Reader. For detailed monthly forecasts for your year ahead, guidance and insight on decisions to be made or just which direction to take, book your personal, confidential tarot card reading with Tim Brooks today! Each tarot card reading I do is individual and personal to you only. I use your request (typed, written or otherwise) to form a link with you, which allows me, through the use of cards, crystals and spiritual guidance to see the path you are on and what is likely to happen should you do nothing to turn aside from this path. This enables me to forecast events for the next 12 months and answer any questions you have. Your questions can be specific or you can ask about a general subject like your career, love life, health, wealth etc. I will tell you what I see and feel - unfortunately this does not stretch to which lottery numbers to pick! Clients often ask how tarot cards work and how I can do a tarot reading for someone on the far side of the world with as little as a typed request which might be very general and several days old. The answer is that I believe we are all linked in some way and information on all of us is recorded in something called the 'Akashic Records', which I tap into. When doing this I gain information on your present situation and the path you are on. This is done on a sub-conscious level using the cards and crystals as physical tools and spiritual guidance as thought forms, feelings and even physical sensations to help me give you the information you need. I firmly believe that we are each travelling our own path, but this path is one of millions of possibilities for us - each major decision we take and those we are offered but decline can change our path for another. The readings I do for you show the path you are on when I do the reading and will show you what lies ahead on that path. It will give encouragement where the outlook is what you want and offer advice and counselling on how to avoid or lessen the impact of those events you would not wish to meet on your journey. Together these help you direct your future to where you want to go. 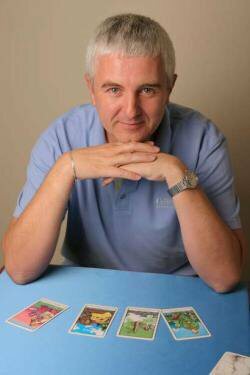 For detailed monthly forecasts for your year ahead, guidance and insight on decisions to be made or just which direction to take, then book your personal, confidential tarot card reading with Tim Brooks today!